1680-denier polyester with reflective trim. Padded vertical computer sleeve fits up to 15" laptop; MP3 zip pocket with audio port; zip front organizer pocket with multiple internal pockets and key holder; zip front pocket with carabiner and web loops; side mesh pockets; adjustable side straps; rubber grab handle. 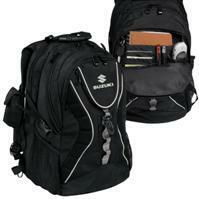 Padded, adjustable shoulder straps with front cell phone pouch; ventilated, air-comfort, padded back. 20"x10"x12-1/2". Embroidery. Black.